Located adjacent to the Alamo, the original Menger Hotel was constructed on the site of Menger's brewery, the first brewery in Texas. Opening on February 1, 1859, "the finest hotel west of the Mississippi River" was host to such notables as Sam Houston, Generals Lee and Grant and Presidents McKinley, Taft and Eisenhower—Teddy Roosevelt even recruited the Rough Riders in the Menger Bar. This handsome hotel has since been enlarged from its first incarnation to incorporate 316 guest rooms and suites and copious amenities; the structure boasts original wrought-iron balconies and details, San Antonio’s largest heated swimming pool, a full-service spa and fitness room, and one of the city's most respected restaurants. Many rooms overlook the Alamo, pool or Alamo Plaza and all retain the furniture, art and accessories from the hotel's earlier days, including four-poster beds, velvet-covered Victorian sofas and chairs, marble-topped tables and period wall coverings. 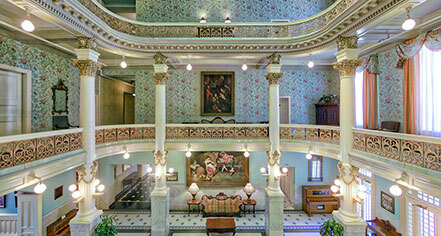 The Menger Hotel, a charter member of Historic Hotels of America since 1989, dates back to 1859. Teddy Roosevelt recruited his famous Rough Riders in the Menger Bar. Hotel/Resort Fees & Taxes: All reservations are subject to a tax of 16.75%. Occupancy Restrictions: Maximum four (4) per room. Parking: Self-parking: Not available. Valet parking: Available; $28 per night. Pet Policy: Service animals allowed: Yes. Pets allowed: Yes. Restrictions: Maximum amount: 1 pet per room. Fees: $125 per pet, per stay. Rollaways: Available upon request; $20 plus tax, per stay. Located adjacent to the Alamo, the original Menger Hotel was constructed on the site of Menger's brewery, the first brewery in Texas. 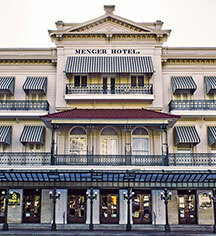 Learn more about the History of The Menger Hotel .